Guides and consumer information related to long-term care insurance. Also contains checklists to help consumers prepare for long-term care and senior living. When shopping for a long-term care insurance policy, it is important to choose a reliable insurance carrier. Applicants for coverage should therefore review an insurer’s financial strength and claims-paying reputation prior to moving forward. In addition, this website contains a number of guides, checklists, and other resources to help you find the insurance policy that you need. 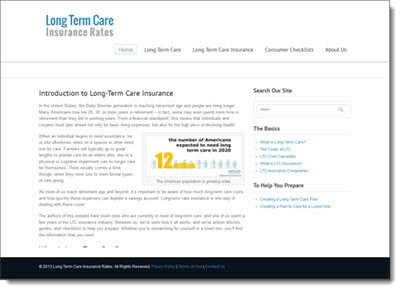 The authors of this website have loved ones who are currently in need of long-term care, and have spent a few years in the LTC insurance industry.